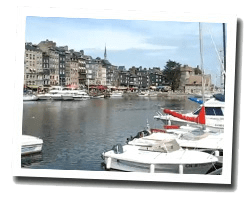 Honfleur is famous for its old harbour, characterized by houses with facades covered with slate. Famous painters have represented it, including Courbet, Eugène Boudin and Claude Monet. Mont Joli offers a panoramic view of the mouth of the Seine. At the seaside you can find two pleasant sandy beaches. 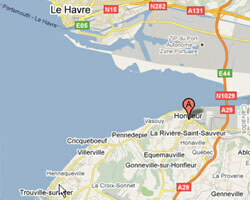 In Honfleur enjoy a seaview holiday rental. Price from 203 € to 404 €. Quai Montpensier,on the 2nd floor of an ancient renovated building ,apartment with view of Vieux Bassin. charming apartment with Old beams, studs, paneling and wall stones . fireplace. 1 Bedroom(s), 1 double bed(s). short stays possibility. Final cleaning : 28 €. KEY WEST: 2nd floor panoramic Apartment for 2 people. 2 french windows and 4 windows are overlooking the old town and port. Price from 203 € to 426 €. 2 rooms apartment 24m2. Close to town centre.